Hugor is a Hugo interpreter for Windows, Mac and Linux. It’s been around for quite a while now, but it only supported video on Linux. I’ve now integrated LibVLC into the interpreter, which makes it possible to easily support video on Mac and Windows too. But I need help with testing it on macOS. I don’t have a real Mac anymore and am using a macOS virtual machine. LibVLC does not play video in that due to lack of hardware acceleration. So I need help with verifying whether video is playing correctly or not. It’s a better test than Future Boy anyway, since it only displays a video loop and does nothing else. If the video plays correctly, please test whether you get an interpreter freeze when you quickly cancel the video with the escape key on your keyboard. Try and spam the escape key as quickly as possible. See if that causes the interpreter to hang. The test game will allow you to do that easily, since when you press escape is will simply restart the video. I tried it out on 10.12 Sierra, and I can’t get it to hang by spamming escape. There are plenty of other issues, but I guess you are not interested in those at this stage. I tried it out on 10.12 Sierra, and I can’t get it to hang by spamming escape. Thanks! So the video shows up fine and when you press escape it restarts the video correctly then? There are plenty of other issues, but I guess you are not interested in those at this stage. I am. Feel free to point out any other issues as well! Well, that depends on your definition of correctly, I suppose. When I first tried it, it started in fullscreen with the video tiny at the center, and it was difficult to see whether it was animating at all. Then I found the preferences, and set fullscreen width to 100%, and then it (almost) filled the screen. This may have been caused by old Hugor preferences in my system folder, though. If I set it to windowed instead, the escape button only seems to work once, after that I get a warning beep every time I press it. There doesn’t seem to be any Retina support, so all text is low resolution. There also seems to be a bug where switching between fullscreen and windowed will erase part of the text at the bottom of the window. A slightly frustrating thing is the missing standard shortcuts and menus. Command+Q doesn’t quit, Command+W doesn’t close the window, trying to scroll the text takes you to a new “scrollback” screen. The keys and gestures you try out of habit do something unexpected or nothing at all. Hm. That is weird. No idea yet why that happens. There doesn’t seem to be any Retina support, so all text is low resolution. There also seems to be a bug where switching between fullscreen and windowed will erase part of the text at the bottom of the window. Unfortunately, this is par for the course with graphical implementations of Hugo. Its windowing system does not support resizing or scrolling. When the window shrinks in size, the contents outside the window are lost and thus appear empty when the window size is increased again. The same happens to anything that is no longer visible (like text or images that scrolled off the screen.) The scrollback view is there to provide a way to still get back to previous text. There might be some tricks possible to get some scrolling support, but not for the time being. Thanks for these. I’m taking notes As mentioned above, the scroll issue is due to how the graphical Hugo engine works. But the rest needs fixing. What other keys and gestures do not work? First of all, thanks for doing this. There are far too few fully-featured Mac interpreters out there. After deleting the settings, the 100% Fullscreen width setting is gone, of course. I think the default is 63%. However, this is not really a problem with the new Retina-aware version you made, as the default video size is now four times as large as before, which is perfectly watchable. The problem seems to be that the window (or the view) somehow loses focus when escape is pressed. If I focus it again by clicking in it with the mouse, escape will work again, but only once. I think the real problem with scrolling is that the two-finger mousepad gesture that I try to use for scrolling instead triggers the scrollback window. It would be much better if it did nothing at all. Regarding the keyboard shortcuts, the only one I didn’t mention was Command+O for opening a new game. But I guess everyone has their own favourite standard commands that they try instinctively. It would be nice if Alt+Enter toggled between full screen and windowed mode. That is not really a Mac standard, but it is common in SDL and Unity-based applications. The new version you linked to is a great improvement, by the way. EDIT: There is something weird going on with the View menu. Enter Full Screen is listed twice when in windowed mode. Also, there is a functional but pretty useless Show Tab Bar command, unless I am missing the point. First of all, thank you for all the feedback! I addressed all the issues you mentioned, and added an option to not bring up the scrollback buffer when using the scrollwheel. Alt+Enter can also be used to toggle fullscreen. One thing that’s not addressed is the beeping escape key. Not sure what causes this. Was it only happening when video is playing, or for all games? Improved SDL audio engine, using SDL_audiolib instead of SDL_mixer. FluidSynth, you can use your own SoundFont instead of the default one. building the interpreter from source. we now use SDL_audiolib, FMOD no longer serves any purpose. graphics should no longer appear blurry. than an absolute pixel value. long on wide screen displays. Fullscreen mode is now restored correctly between sessions. 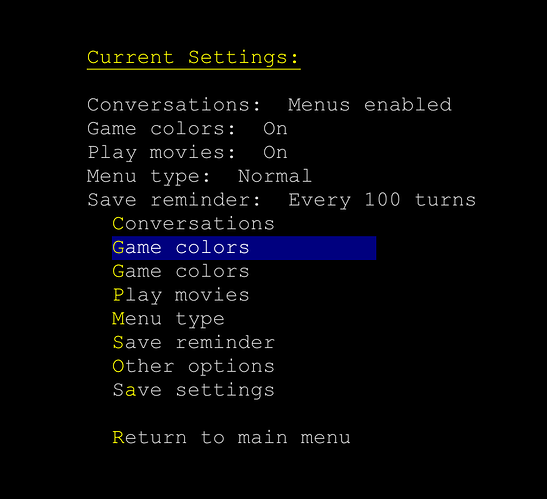 fullscreen mode, in addition to the platform-specific shortcuts. 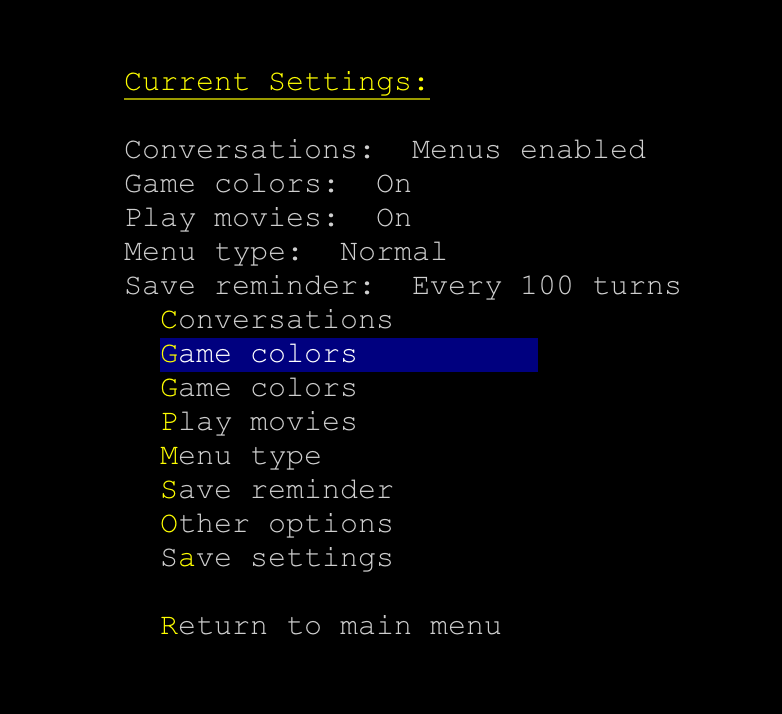 and a custom color can be manually configured. The scrollback font is now configurable. wrapping is configurable through a new configuration option. Pasting words on double-click now only works with the left mouse button. scaling” option has been removed from the preferences dialog. /usr/local by default. See README on how to change the default path. Building the source code now requires at least a C++14 compiler. I’ve downloaded a bunch of Hugo games and pretty much everything seems to work, including movies and midi music. Thanks for implementing my suggestions! That system beep when pressing escape thing is pretty rare. I think a system beep usually means that the active view does not accept keyDown events. The only problem I have found is that switching between fullscreen and windowed mode tends to cause all kinds of glitches. One easily reproducible example is the options menu in Future Boy, which seems to lose track of its coordinates and print lines twice. This is one of those “it’s how the Hugo engine works” things. Hugo games don’t keep track of screen size changes as they happen. They only do that after entering commands, and even then, it’s a bit half-assed as they don’t repaint the screen. As a result, resizing the interpreter window will cause things like this until you leave the menus and enter them again. I’m thinking about ways to work around this issue, but since this could cause incompatibilities with some games (an extreme example would be Hugo Tetris), I left it for a future release. It’s been 8 years since 1.0 and I wanted to finally get a new version out the door.